The Discovery Channel found a hit show 15 years ago with “Mythbusters,” a science-based program in which generally held public theories were tested and shown to be either true or false. Two-time U.S. Olympian Guy Gosselin is a hockey man, not a scientist, but he sometimes finds himself in a similar mythbusting role with USA Hockey and one of the core principles of the American Development Model. The myth is that cross-ice hockey is impeding the progress of 8U players. Quite the contrary, Gosselin says – and the data supports him, both in terms of what’s happening in the moment and also in terms of how those players are developing in future years. The fact is that cross-ice hockey, which puts 8U players into smaller spaces, is the optimal playing environment for high-performance development. This one comes mainly from those who see cross-ice hockey – which, as the name suggests, turns the width of an ice sheet into the length and splits it in half – as a lesser form of the sport they grew up with. The message from Gosselin, who played in the NHL with Winnipeg and also on three U.S. Men’s National Teams: Hockey has evolved, and the concepts taught in cross-ice hockey more closely mirror the way the game is played now. It’s a more accurate representation of the game as compared to full-ice hockey at 8U. To simulate that small-area competition, cross-ice is the best solution until kids get older and bigger – thereby taking up more space and covering more of the ice. The contrarian might be saying: if there is all this small-space work, kids must not be learning to skate in cross-ice hockey. A recent case study conducted by USA Hockey found that the typical adult player takes 15 to 17 strides to skate end to end on a 200-foot full ice sheet. The typical 8-year-old takes an almost identical 14 to 16 strides to skate the length of the ice in an 85-foot cross-ice setting. So cross-ice is actually scaled perfectly for the differences in player size, including limb lengths, along with physical maturation. The skating in cross-ice hockey emphasizes quickness in shorter bursts and changes of direction, but that again more directly mimics the way hockey is being played these days and will benefit kids more as they move up the ranks. Another study, this one conducted in Alberta, showed that 8U skating acceleration speeds increased as the ice surface size was reduced. Average skating acceleration speeds were 10 percent faster in cross-ice hockey compared to full-ice hockey. Additionally, the average distance 8U players needed to reach top speed was 65 feet. Advanced skaters reached top speed in 60 feet or less. The cross-ice playing surface is 85 feet in length, meaning 8U players can and do reach top speed in cross-ice hockey. OK, what about the kid who used to skate circles around everyone (or through huge empty spaces) on the full ice sheet? Aren’t those advanced players being penalized by negating their advantages? The short answer is no. 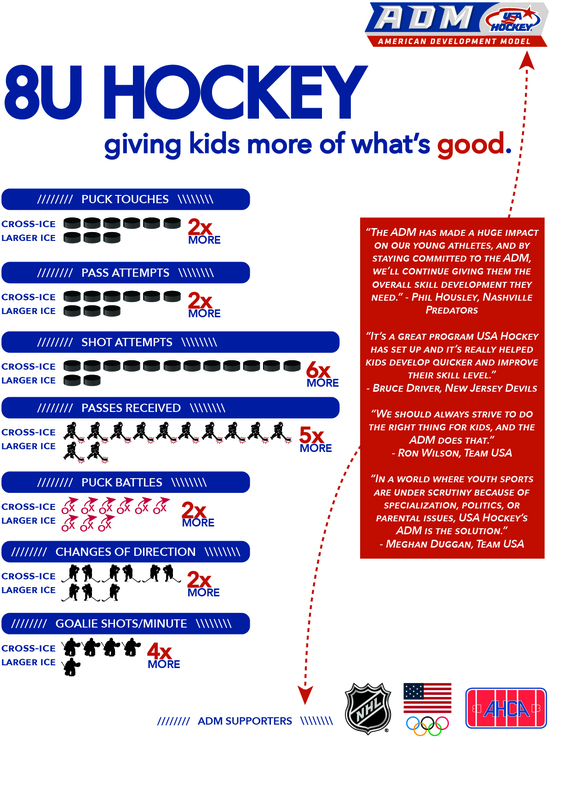 In fact, while cross-ice hockey benefits every 8U player, it benefits advanced players most of all because it puts them in a more challenging hockey environment where they don’t have limitless time and space. It also helps them take complete advantage of the physiological windows of trainability and it gives them more skill repetitions. In giving all players more chances to touch the puck, cross-ice hockey mitigates the artificial separation of players that can occur at 8U. The best skaters aren’t necessarily the best players, Gosselin says, but a big ice sheet can trick coaches into thinking that. And finally, the myth that annoys Gosselin the most: that cross-ice hockey is boring. When young players have more fun and feel involved, they stay in hockey longer and have a better chance to reach their full potential.